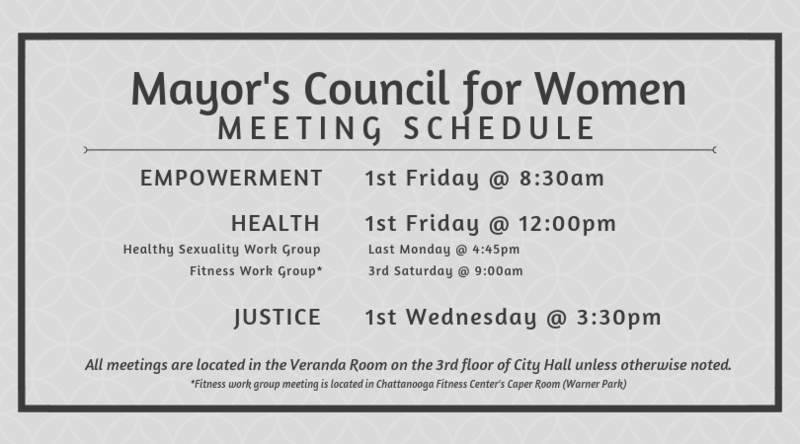 All of the meetings for the Mayor's Council for Women are open invitation, whether it is your 1st meeting or your 50th meeting. The general meeting schedule can be seen below, but feel free to click "Calendar" at the top of the page for a more detailed schedule. Fill out the membership form below to join the Mayor's Council for Women! Please check the box(es) of the areas of focus that you are interested in being more involved with. Are you interested in any of the following work groups? Please check the box(es) of the work groups you are interested in.